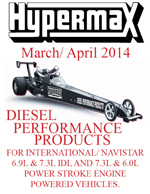 Hypermax Premium Ultimax CGI (Compacted Graphite Iron) 7.3L Powerstroke Crankcase. Racers Special Discount for a limited time only. In stock to ship today, no 6 week lead time. Want rods? We have them. 1994-2003 Ford 7.3L Power Stroke Performance Ultimax Head Gaskets. Rated to over 90 Psi boost! 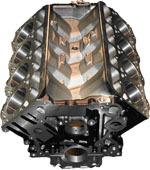 The Hypermax Ultimax High Rev Valve Spring Package is engineered to stop high RPM valve float, bent push rods, and broken rocker arms by utilizing this increased load spring package. 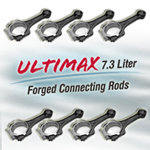 Hypermax Ultimax Pushrods (Set of 16). Eliminate bent pushrods and broken rocker arms with these .375 diameter heat treated alloy steel push rods. Hypermax Ultimax High Temperature Exhaust Valves (Set of 8). 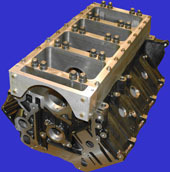 Inconel valves specially engineered to withstand the increase temperatures.